Teaching young students how to deal with failure is important; but what about teaching them to overcome real or perceived barriers to success so that they approach their future with confidence as well as resilience? 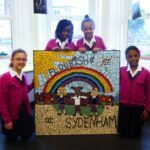 Head of Sydenham High Junior School Claire Boyd describes how an ambitious co-curricular initiative is aimed at helping to achieve this for the school’s youngest pupils. Sydenham High has always had a strong reputation for developing student resilience and whole-girl centred learning. Helping girls to be the best they can be and reach their fullest potential is at the heart of a Sydenham High education. This means ensuring each girl can embrace and channel the lessons of failure but it also means ensuring they have the confidence to move on to success and can see around future problems. Our determination to start that process at Junior School has led us to create Flourish and Fly, an extensive programme of activities and challenges designed to ensure girls are equipped to look beyond obstacles to achieve their goals. It is being embedded into all aspects of Junior School life and complements the highly developed PSHE curriculum already in operation throughout the whole school, all the way from Early Years to Sixth Form. The initiative will work across subjects and year groups to stretch ability, build confidence and develop collaborative working. Each half term will take on one of the four Girls’ Day School Trust values – Be Bold; Girls First; Be Principled and Networked – as its theme, culminating in a week of activities and challenges to bring that particular value to life. Last half term our students – from Reception to those in Year 6 preparing to go up to the Senior School –explored what it means to ‘be bold’, starting with girls rising to the challenge of being the best role model they could be for their peers and delivering random acts of kindness around the school. It also included an Assembly from Sydenham High Headteacher Kathryn Pullen, suggesting that the girls should be more like giraffes when it comes to being bold: show big hearts, stick their necks out and see over the ‘excuses wall’. The final week’s activities (9-13 February) gave students ample opportunity to challenge themselves and discover the different roles and responsibilities that are open to them. Highlights included a collaborative art project to which all the girls contributed to creating a giant Mosaic installation; a playground Speaker’s Corner; subject master classes with Senior School scholars; a series of forensic science detective workshops in which the girls worked together to solve a crime scenario using finger-printing and an assault course challenge. Parents also joined staff and girls for a ‘Wake and Shake’ workout before school. Flourish and Fly is an exciting and bold initiative that has true Sydenham Spirit at its heart. We want every girl to find her spark, challenge herself and soar ahead knowing that she has the ability to see around obstacles when they arise. All our girls need to be able to truly flourish and fly, not flip and flop, when it comes to facing the future. We’re looking forward to challenging all our students with more activities and thought-provoking experiences in the coming half term, when our focus will be Girls First.